Growing urban population, rising construction activities and industrialization would be some of the key drivers behind the growth of the Vietnam switchgear market during the forecast period. Further, the revised Power Development Plan (PMP VII) 2011-2020 and government's focus on improving transport infrastructure would surge the demand for switchgears in the country over the next six years. According to 6Wresearch, the Vietnam switchgear market size is projected to grow with a CAGR of 7.1% during 2018-24. According to Vietnam Electricity (EVN), the demand for electricity is expected to double between 2014-20 and is expected to attract investments worth $7.5 billion per year during the same period. Government plans such as National Transport Master Plan (2011-20) and the $121 billion Ho Chi Minh City Master Transport Plan are likely to create huge opportunities for switchgear companies as these would lead to infrastructural development across the country. According to Government of Vietnam (GVN), the manufacturing and processing sectors are expected to flourish and contribute significantly to the industrial segment of Vietnam on account of growing foreign investments in the country. Further, government's target to reach 100% rural electrification by 2020 would also drive the demand for switchgears in the country during 2018-24. Power utilities acquired maximum revenue share in the overall Vietnam switchgear market share in 2017 due to integration of renewable energy plants and continuous expansion of power transmission & distribution network across the country. Development of urban and low-income housing residential units would be key factors on account of which residential segment would register highest CAGR during 2018-24. 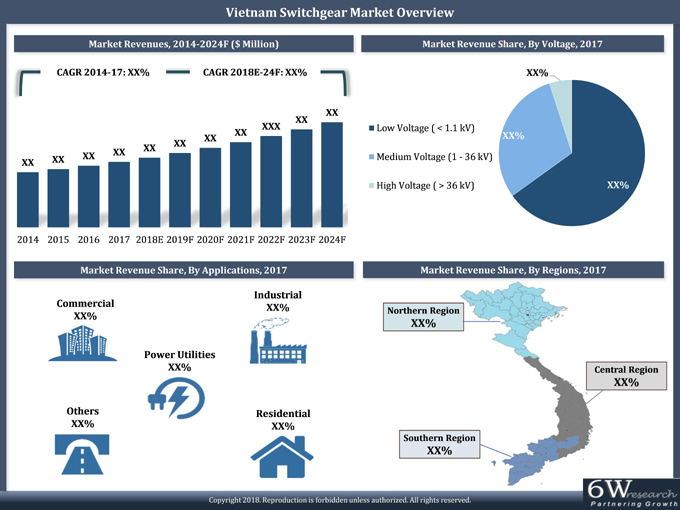 The Vietnam switchgear market report comprehensively covers the Vietnam Switchgear Market by voltage, insulation, types, applications and regions. The Vietnam switchgear market outlook report provides an unbiased and detailed analysis of the Vietnam switchgear market trends, opportunities/high growth areas, market drivers which would help the stakeholders to device and align their market strategies according to the current and future market dynamics. 13.4 Fuji Electric Co. Ltd.